Sadly this is where the topic of justification remains—in our imagination. But God’s judgment is not an image in the mind. It is a fact, as we confess in the Creeds “to judge the living and the dead.” We will all stand in before God for judgment. What will our plea be? And will be God’s verdict? By nature, everyone knows something of God’s Law (Rom 2:14), and everyone knows just enough to think that he can justify himself. This is why our first reaction, our first thought when confronted with our own sin, is not to confess it and ask forgiveness, but to offer an excuse, a reason, for why it was done. However, justification and the peace it brings is a gift from God not a merit from our own work. God strikes down every attempt at self-justification with a damning and universal, “No! It’s not enough! All are condemned!” The New Testament puts forth an unavoidable, universal, and unalterable truth: “Now we know that whatever the law says it speaks to those who are under the law, so that every mouth may be stopped, and the whole world may be held accountable to God. For by works of the law no human being will be justified in his sight, since through the law comes knowledge of sin” (Rom 3:19–20). Repeatedly the New Testament blankets “all” with condemnation under the Law of God: “None is righteous, no, not one” (Rom 3:10); “all who rely on works of the law are under a curse” (Gal 3:10); “in Adam all die” (1 Cor 15:22). Although every attempt at self-justification before God is futile and damning, there is a justification before God, there is a declaration and a counting of a person as righteous that leads to eternal blessedness. It is by God’s act alone, not ours. We are justified before God freely by grace. Grace is a gift—undeserved, unearned, unexpected, and unbelievably generous. St. Paul wrote: “But the free gift is not like the trespass. Therefore, as one trespass led to condemnation for all men, so one act of righteousness leads to justification and life for all men. For as by the one man’s disobedience the many were made sinners, so by the one man’s obedience the many will be made righteous. Now the law came in to increase the trespass, but where sin increased, grace abounded all the more, so that, as sin reigned in death, grace also might reign through righteousness leading to eternal life through Jesus Christ our Lord.” (Rom 5:15, 18–21). We are justified before God “for Christ’s sake,” not because we changed something within ourselves. It may be easy to conclude that we are better people under the Law because faith does create love and motivate good works. However, though we do grow in grace, no matter how we grow, “the Law always accuses us, always presents an angry God to us. . . . In the flesh we never satisfy the Law” (Ap V, 174–175). Thus justification is not a one-time event. God “justifies the ungodly” (Rom 4:5). It is a present tense, on going reality. To be just, then, means that we must also always be “ungodly” under the Law. The definitive work in justification is outside us, not inside us. This work was performed by Jesus Christ, not us, and it occurred on Calvary more than two thousand years ago. “It is finished!” Jesus cried out from the cross (John 19:30). The apostle Paul explains: “In Christ God was reconciling the world to Himself” (2 Cor 5:19). This act transcends all of history. It was justification for me and for everyone who ever lived before or after Jesus. Peter testified, “There is no other name under heaven given among men by which we must be saved” (Acts 4:12). We are justified by grace for the sake of Christ through faith. In justification, which is God declaring us not guilty, faith is passive; it only receives the gift. If salvation is by grace, then it is free and not our doing. If salvation is for Christ’s sake, that is because of His work, then its cause and source are outside of us and apart from us. Faith is nothing in and of itself. It merely lays hold of Christ, His accomplished work, the forgiveness of sin. There is no stepping forward in the glare of the Almighty and pleading, “Look and my faith! Look how much I believe.” If that were so, then justification would no longer be free nor by grace. St. Paul writes: “For by grace you have been saved through faith, And this (that is, your salvation and your faith) is not your own doing; it is the gift of God” (Eph 2:8–9). His promised grace is itself a gift, and because it is a gift from His doing and giving, it is sure and certain. 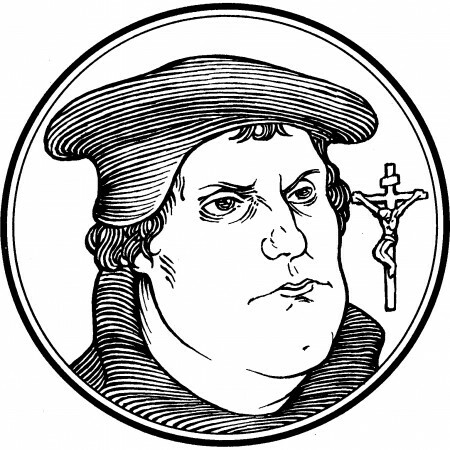 In April of 1516, a year and a half before he nailed the 95 Theses to the door of the Castle Church in Wittenberg, Luther wrote to his fellow monk and friend George Spenlein, who was suffering under the weight of his own sin to the point of despair, even considering taking his own life: “My dear brother, learn Christ and him crucified. Learn to pray to him and, despairing of yourself, say: “Lord Jesus, You are my righteousness, but I am Your sin. You have taken upon Yourself what is mine and have given to me what is Yours. You have taken upon Yourself what You were not and have given to me what I was not.” Beware of aspiring to such purity that you will not wish to be looked upon as a sinner, or to be one. For Christ dwells only with sinners” (Luther, Letters of Spiritual Counsel, 110). Christ came only for sinners. He didn’t come for the healthy but for the sick. He didn’t come for the righteous but for sinners. There is no middle ground. Either you are justified by grace for Christ’s sake through faith or you will justified by your works, your merits, which leads to hell. Christ only dwells with sinners. And so, is the Reformation still relevant? Do we still find ourselves confronted by our sinfulness? Are we not at times filled with despair and horror at what we have done or left undone? Are our consciences not troubled by the evils that lurk in our thoughts, words, and deeds? Can a sinner, can we, who can not fulfill the Law of God, find a merciful and loving God? If that’s not relevant, then I don’t know what is. For we will all be judged. We will all stand in God’s courtroom before His throne. And our only plea can be “I a poor miserable sinner . . . . forgive me by grace for Christ’s sake.” And if that is your plea, if that is your confession, the verdict will be “Not guilty.” Amen.